To make arepas: In large bowl, stir corn flour, water and salt with spoon; let rest 1 minute or until mixture thickens. Stir in mozzarella cheese. Form 4 balls of dough, using about 1/2 cup dough each. Place each ball on plastic wrap; shape each into 3 1/2-inch circle, 3/4 inch thick. In 12-inch skillet, heat oil over medium heat. Cook arepas in oil about 4 minutes on each side, until dark spots appear on both sides. Place arepas on ungreased cookie sheet. Bake about 20 minutes or until fully cooked and hollow sounding when tapped. Cool about 20 minutes. Meanwhile, make chicken filling. In medium bowl, mix all filling ingredients until well blended. To serve, slice each arepa vertically but not all the way through. Fill each with about 1/2 cup filling. Arepas can also be served topped with cheeses or simply spread with butter. 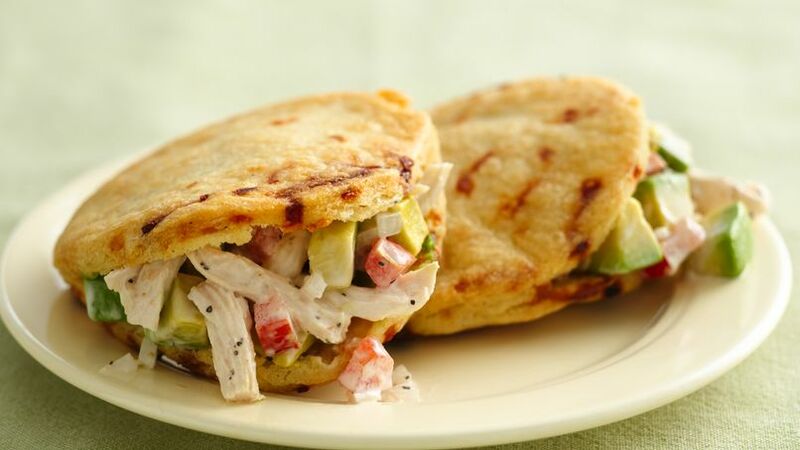 Enjoy these delicious arepas that are filled with chicken – a wonderful dinner.